PICTURE - Ashoka Pillar Capital in rupee coin. 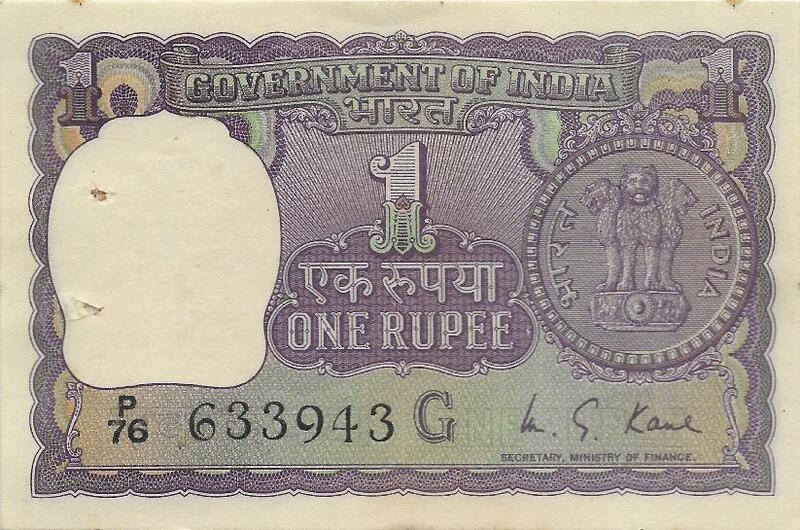 LEGEND - Secretary Ministry of Finance. 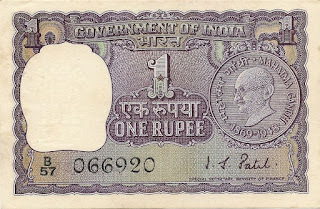 NUMERAL - '1' in three places. 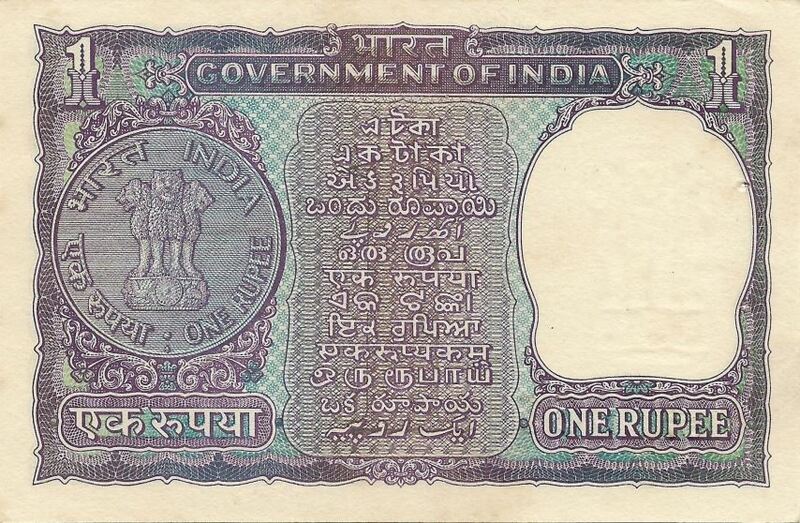 VALUE LEGEND - English and Hindi. 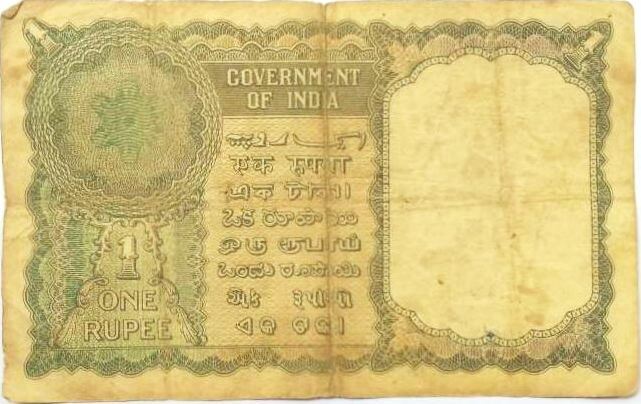 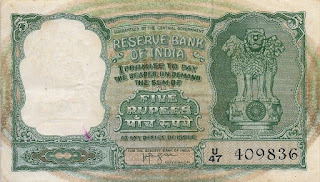 PICTURE - Rupee coin with dated 1957. 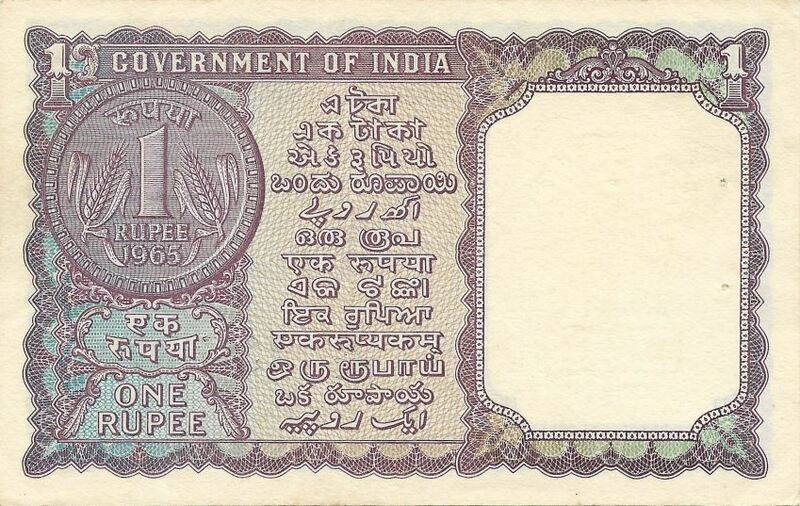 LANGUAGE PANEL - 7 Indian Languages. Obverse PICTURE - Ashoka Pillar Capital in rupee coin. 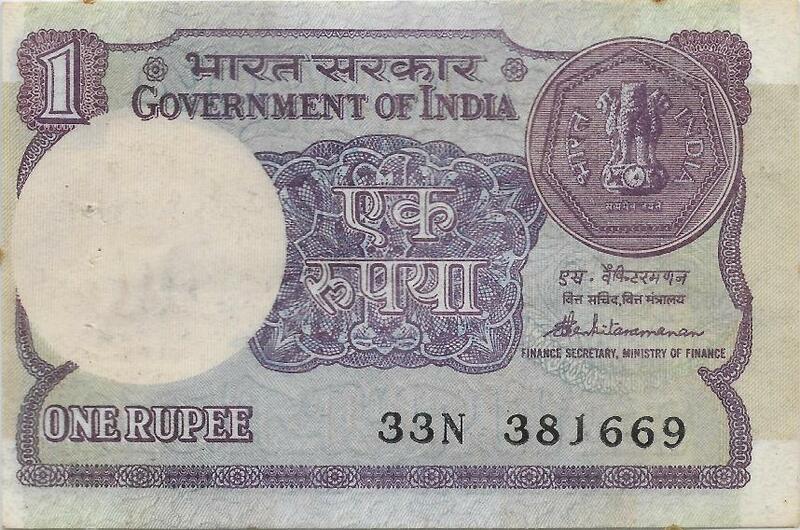 PICTURE - Rupee coin with dated 1965. LANGUAGE PANEL - 13 Indian Languages. 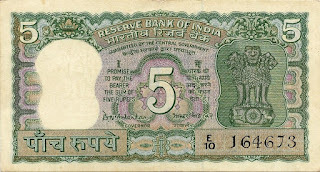 Ashoka Pillar Capital in rupee coin. LEGEND - Special Secretary Ministry of Finance. 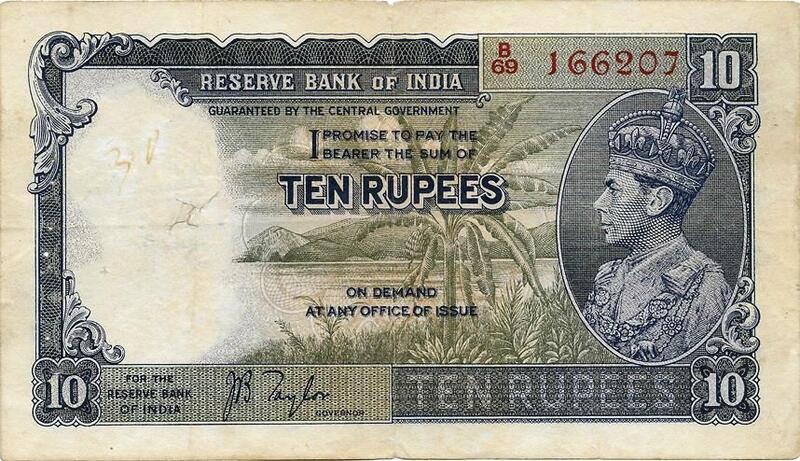 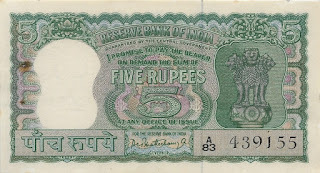 PICTURE - Rupee coin dated 1968 or 1969 or 1970 or 1971 or 1972. 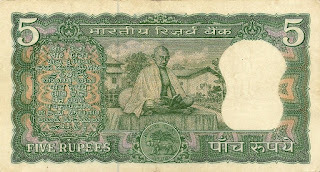 PICTURE - Mahatma Gandhi in rupee coin. 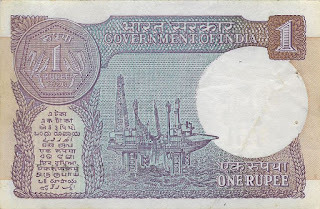 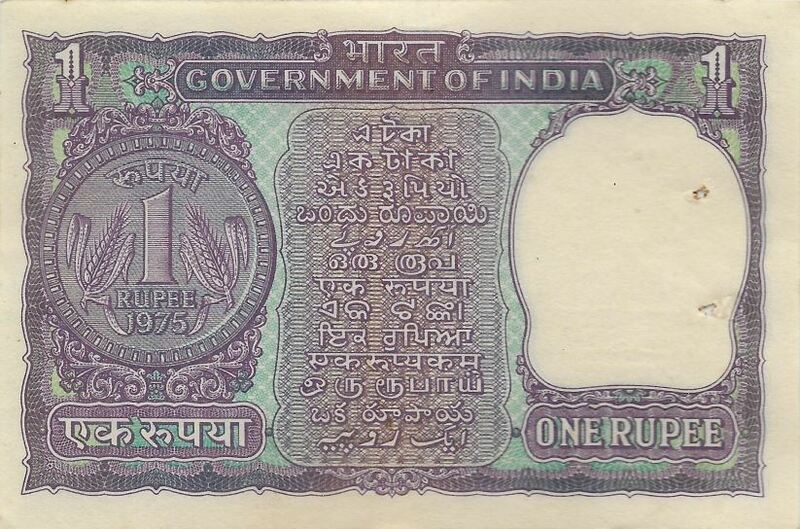 Reverse PICTURE - Rupee coin dated 1973 or 1974 or 1975 or 1976. Lion Capital of Ashoka on the right side. Tiger's head at left; Language panel with 7 native Indian scripts in centre; The Reserve Bank of India's logo at bottom. 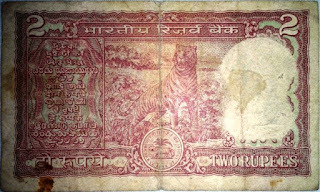 A new design was adopted with Standing Tiger at the back. 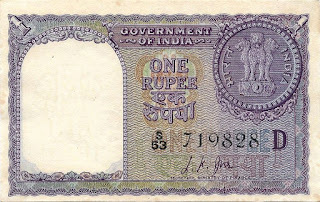 The size was reduced by few mm to save on paper. 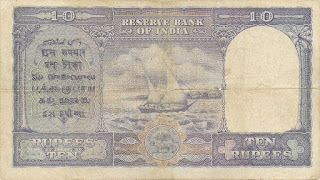 Notes of other denomination had substantial size reduction. 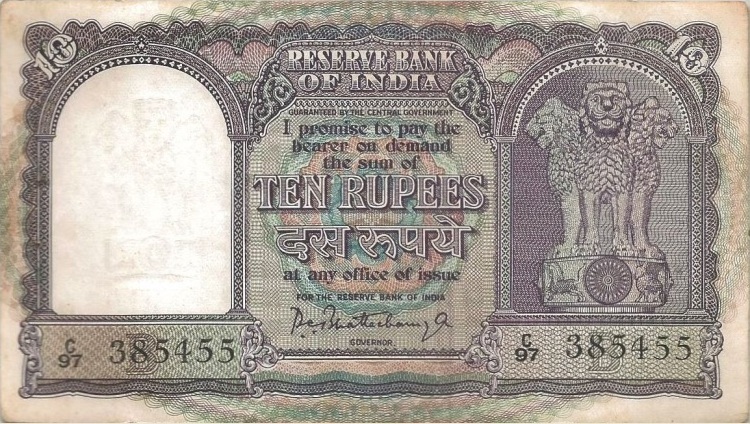 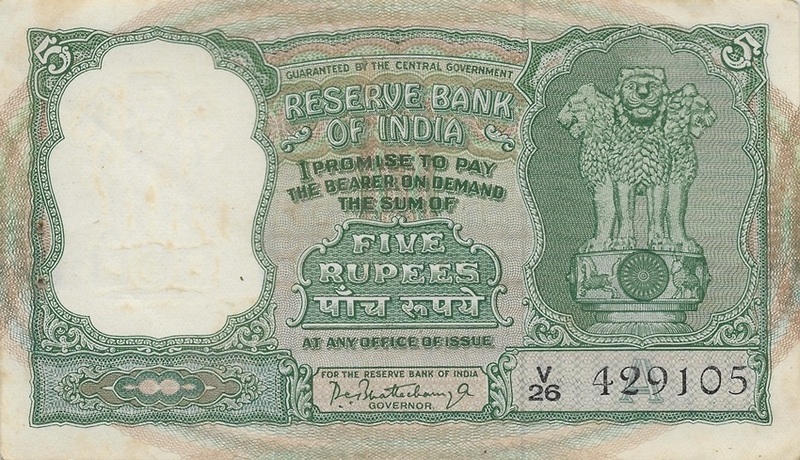 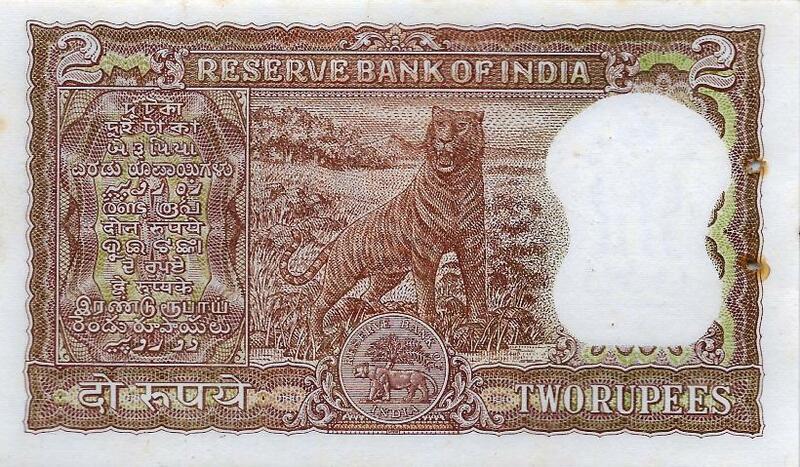 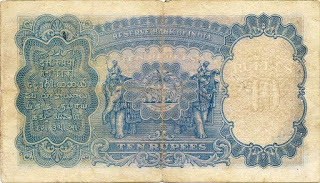 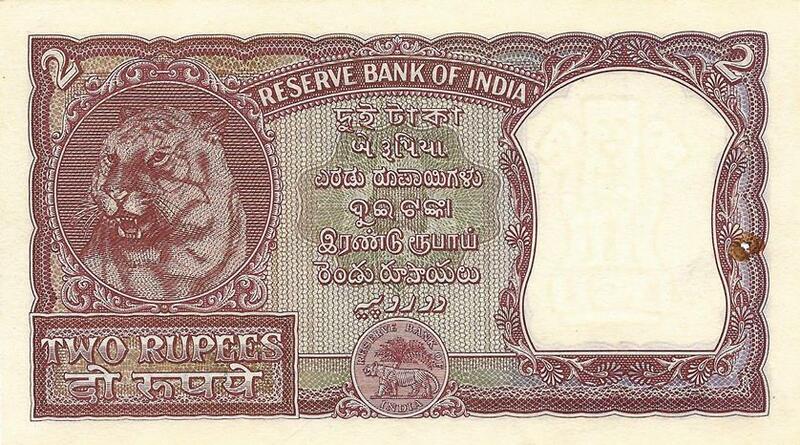 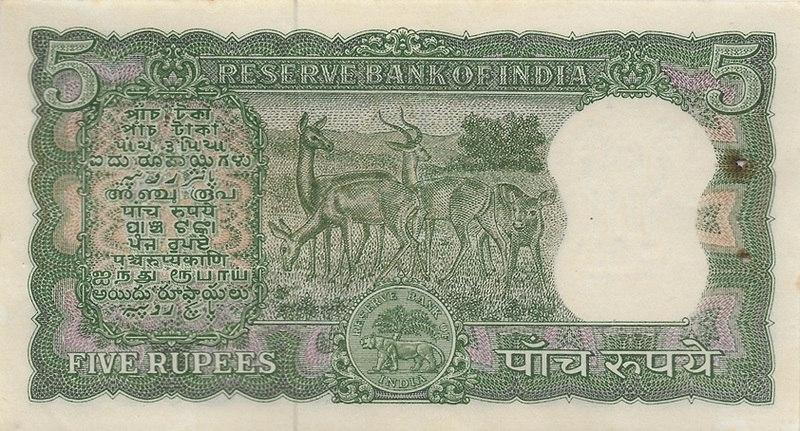 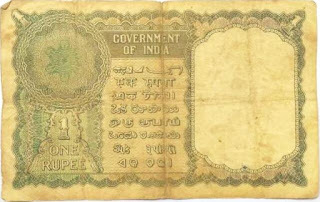 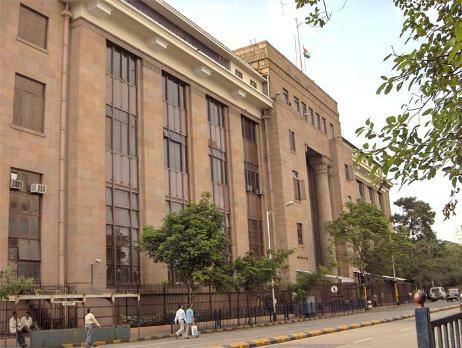 Standing Tiger; Language panel with 13 native Indian scripts on the left side; The Reserve Bank of India's logo. 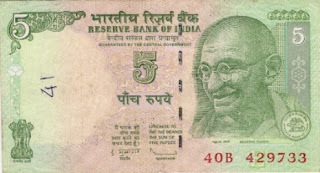 On the occasion of Mahatma Gandhi's Birth Centenary, all the currencies were specially designed to include the photo of Gandhi. This was done for all denominations. Numeral "2" at center; Lion Capital of Ashoka on the right side. 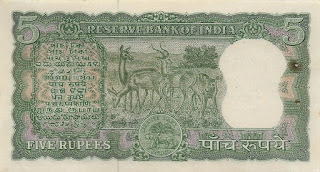 Signature: R. N. Malhotra (Governor, 4th of February 1985 to 22nd of December 1990). 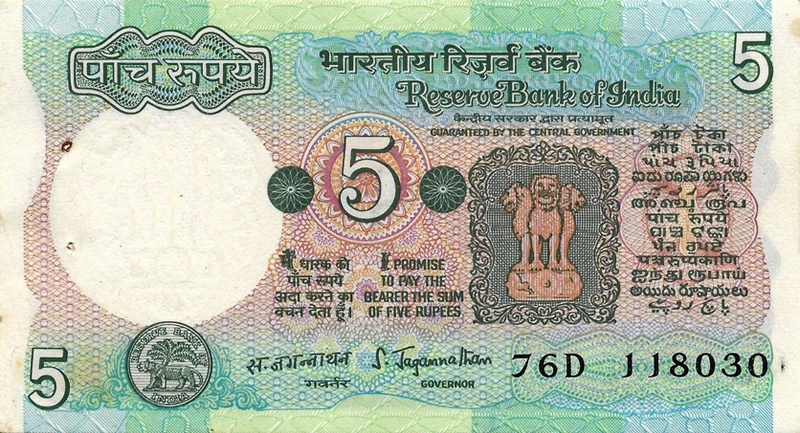 Obverse: National Emblem of India - Lion Capital of Asoka (Ashoka column), sculpted from sandstone, preserved at Sarnath Museum which was originally erected around 250 BCE atop an Ashoka Pillar at Sarnath; The wheel "Ashoka Chakra" on it's base is a centerpiece of National Flag of India; "Satyameva Jayate" National Motto of India is inscribed under it. 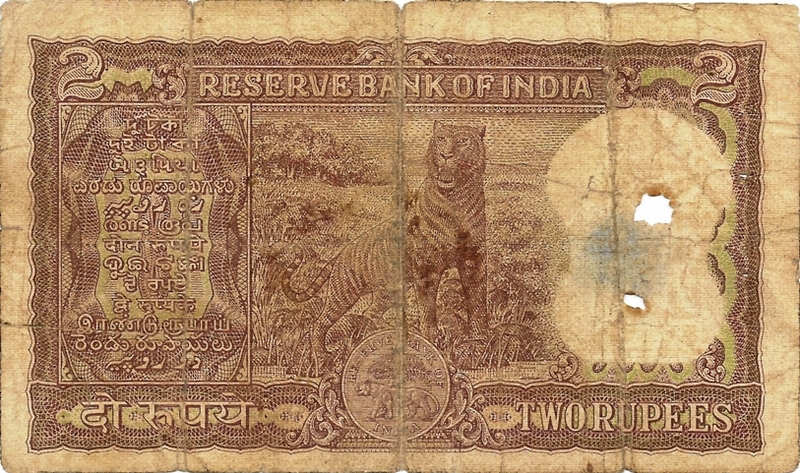 Reverse: Bengal tiger (Panthera tigris igris) or Panthera tigris bengalensis). 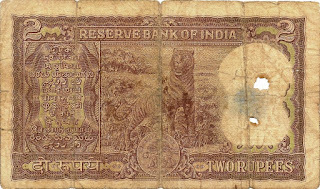 Watermark: Lion Capital of Asoka Pillar. 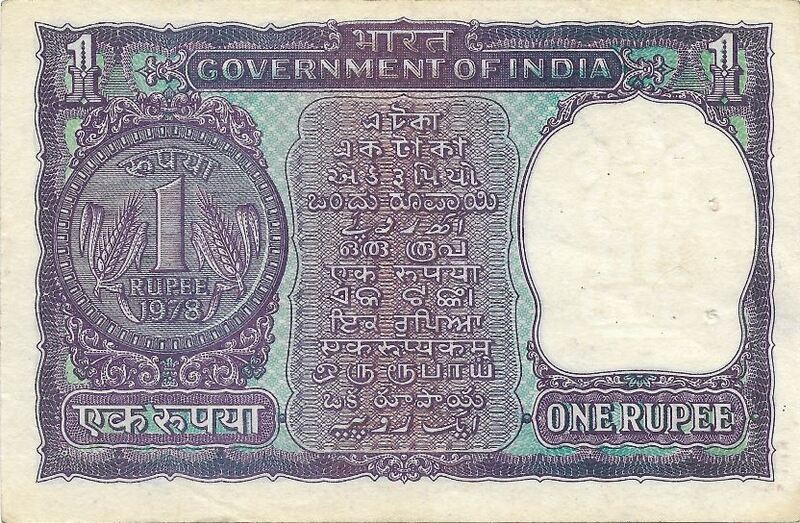 Date of Issue: 11th April 1986. 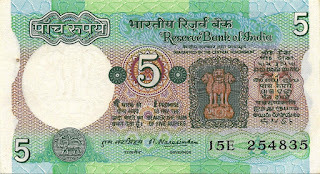 Printer: Security Printing and Minting Corporation of India Limited (SPMCIL). Original Size: 107 x 63 mm. 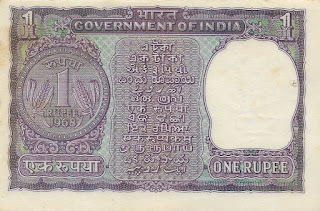 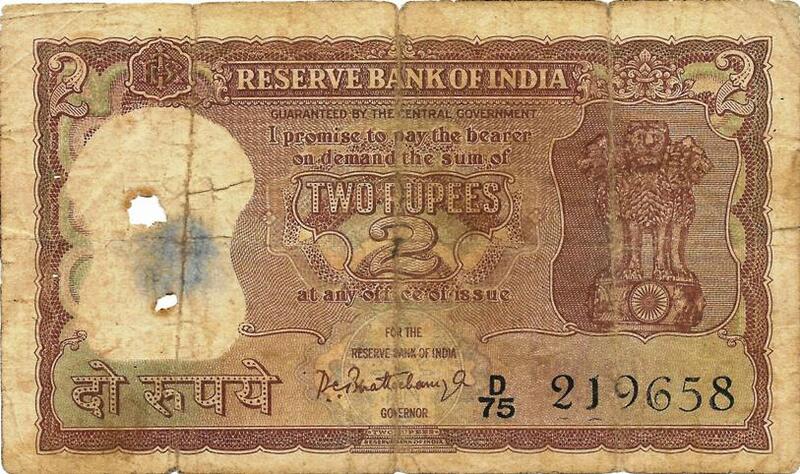 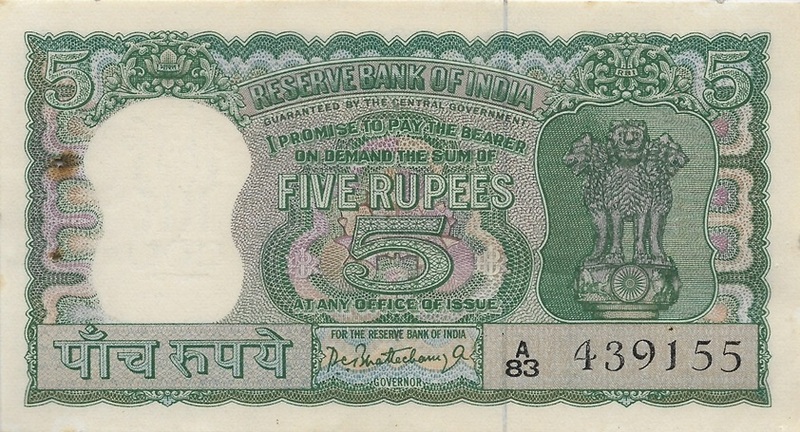 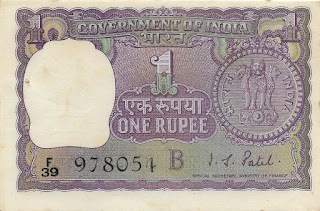 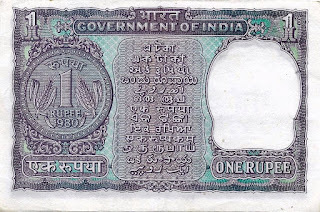 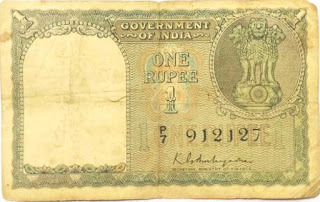 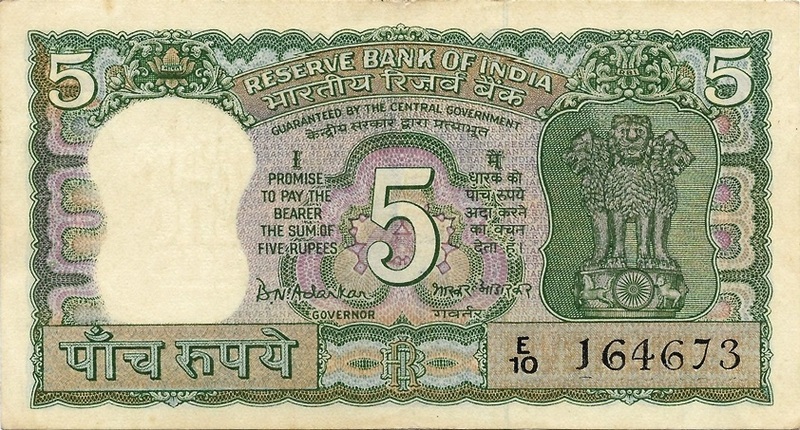 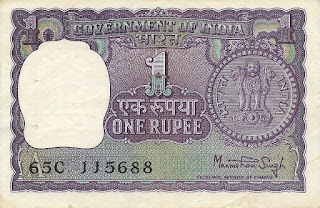 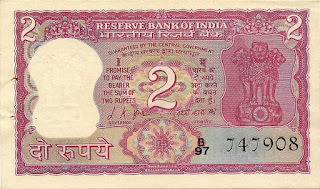 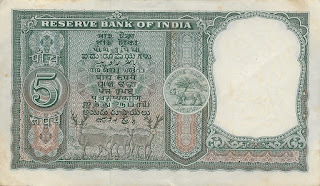 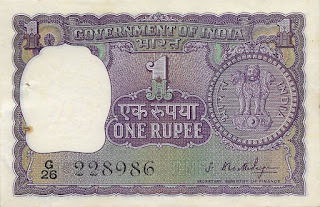 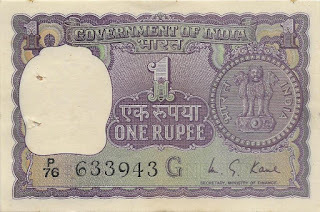 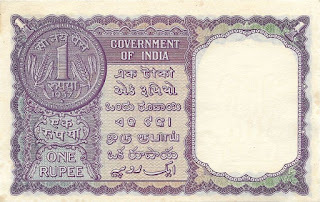 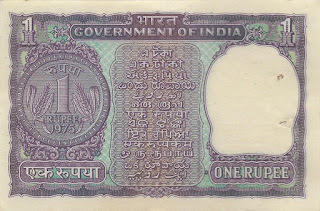 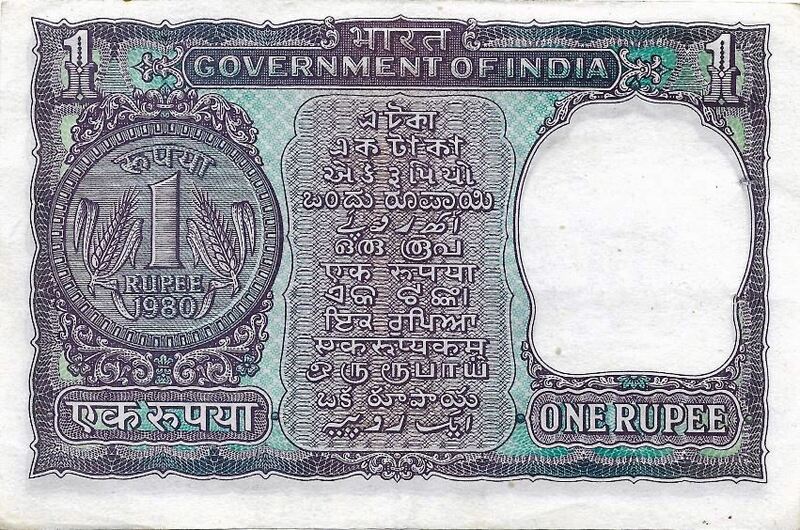 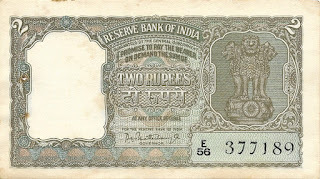 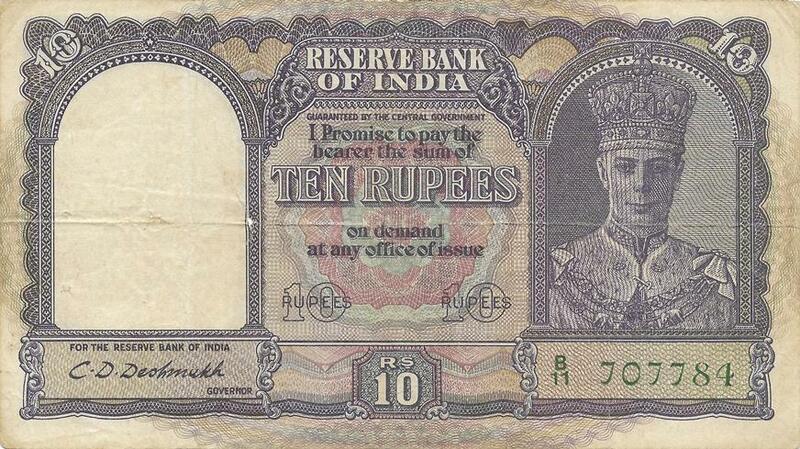 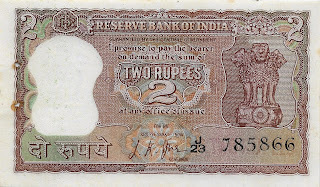 Texts: Reserve Bank of India; Guaranteed by the Central Government; I promise to pay the bearer the sum of Two Rupees. 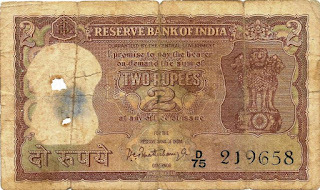 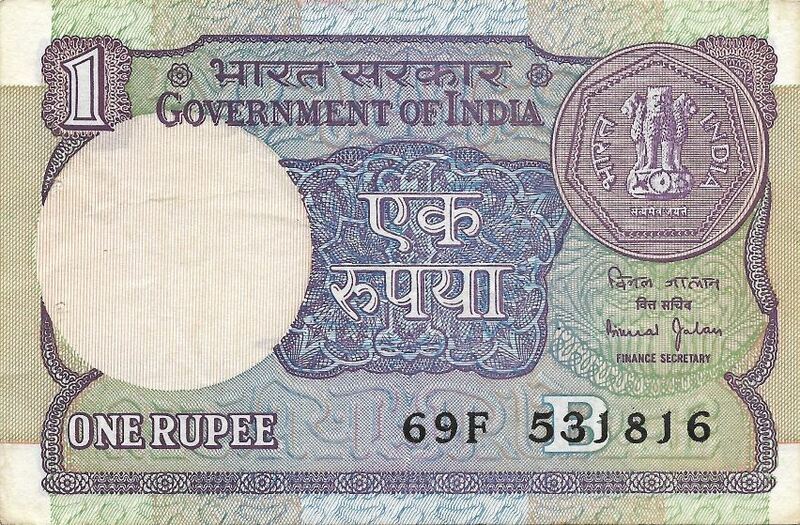 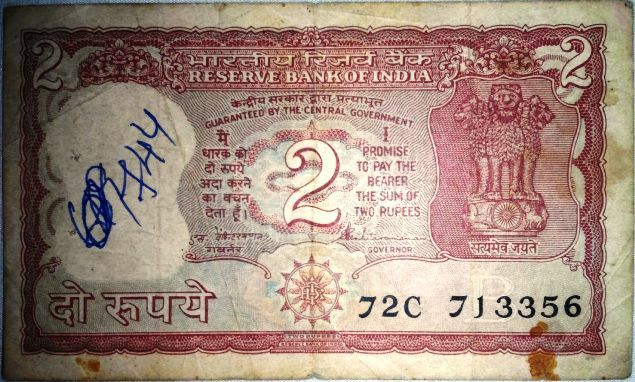 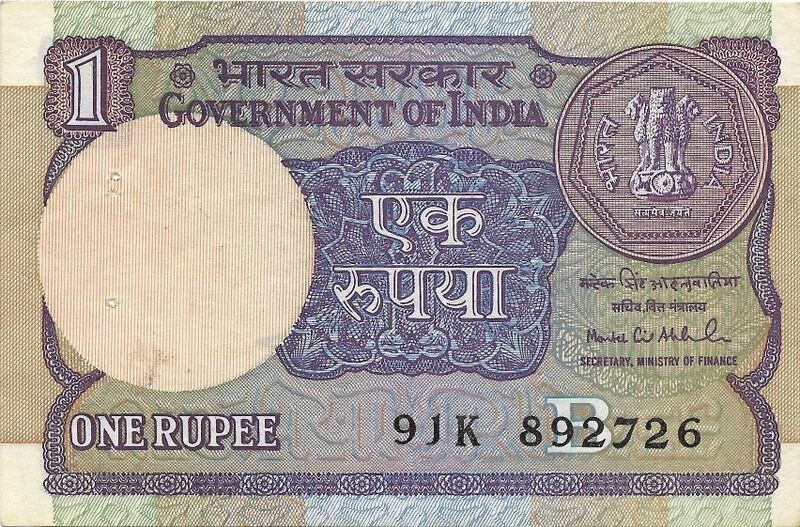 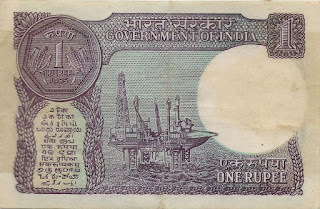 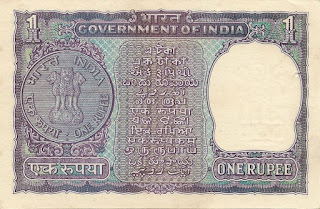 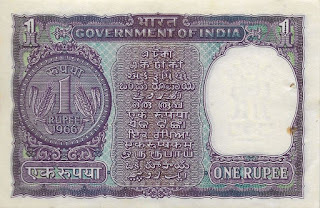 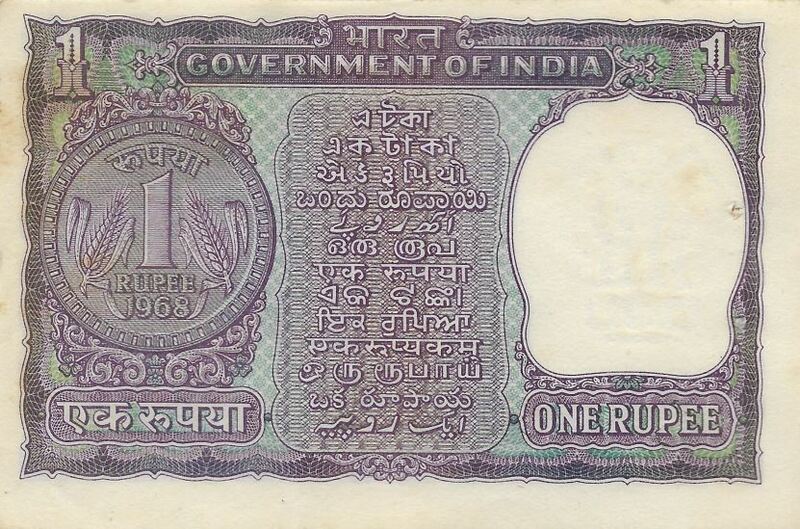 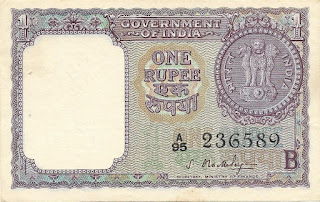 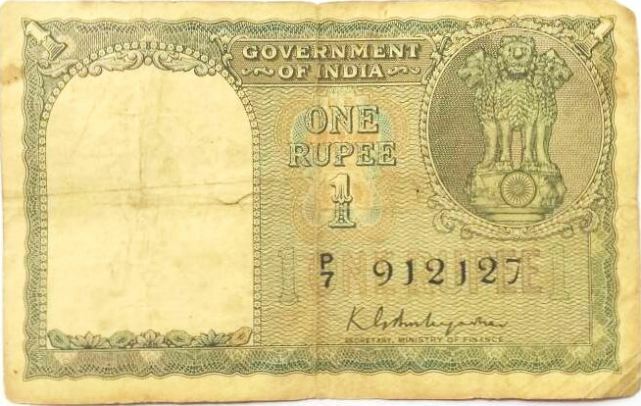 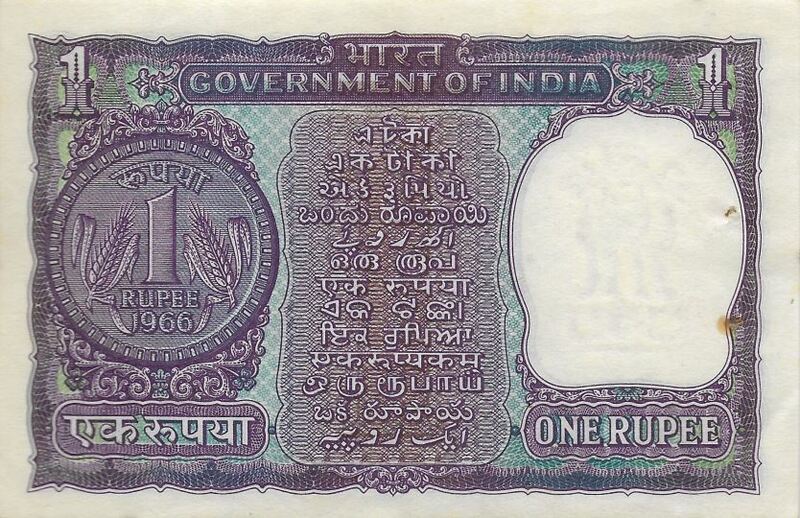 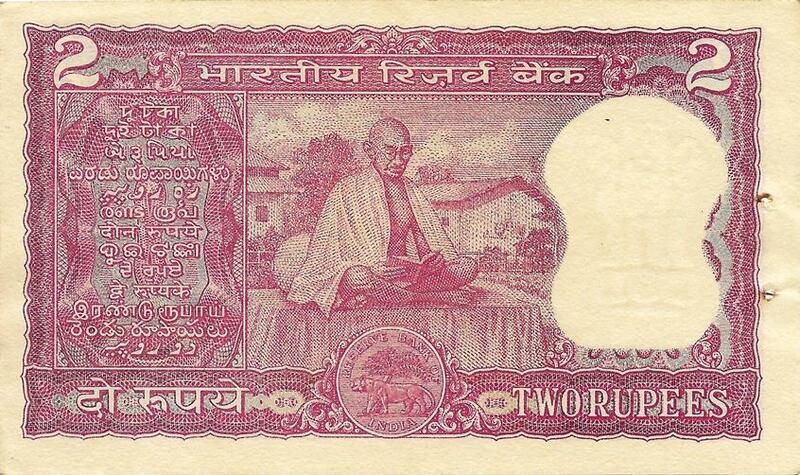 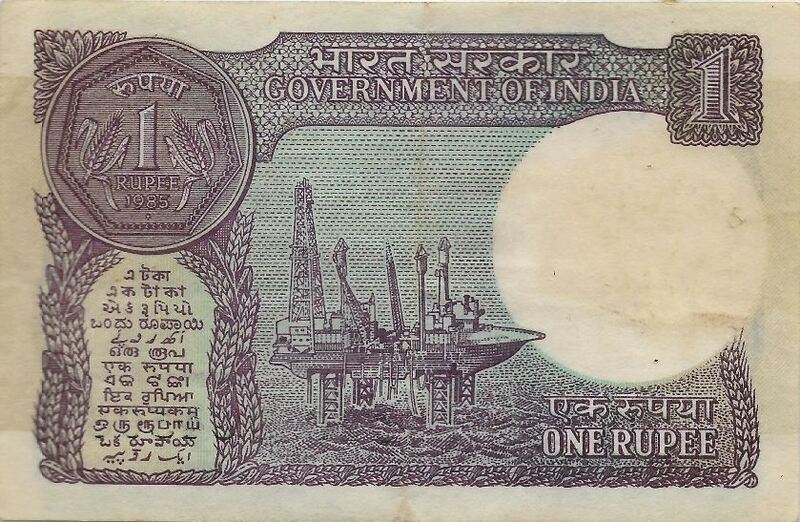 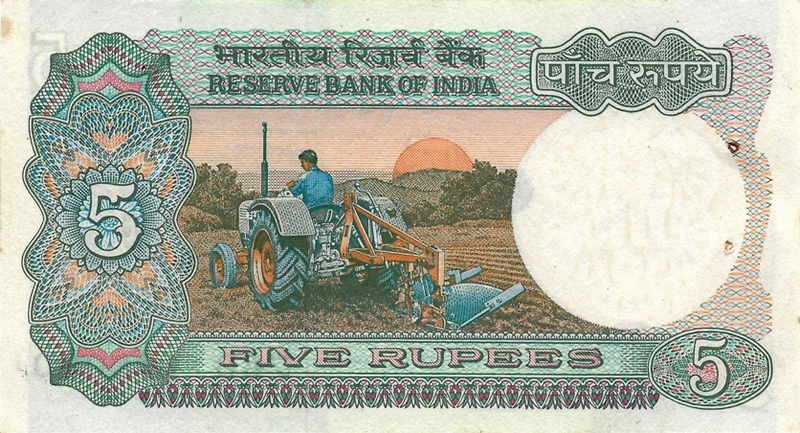 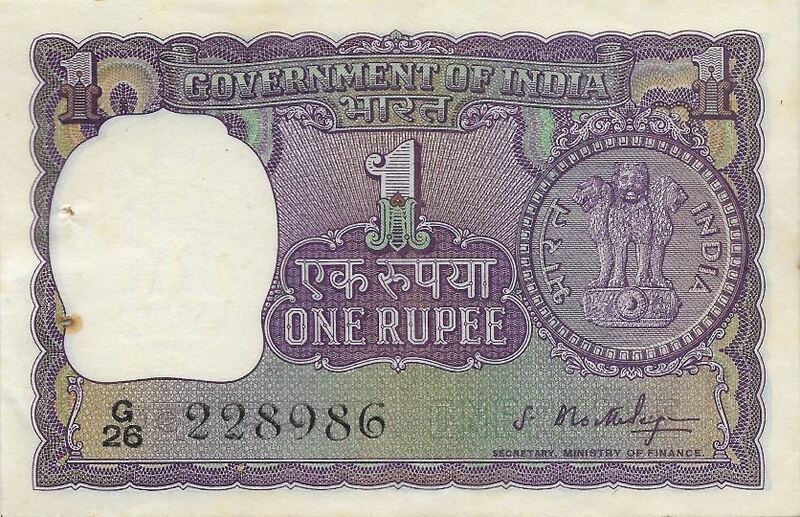 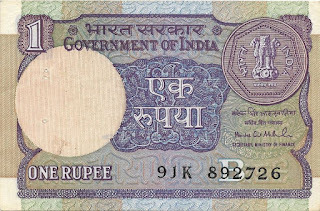 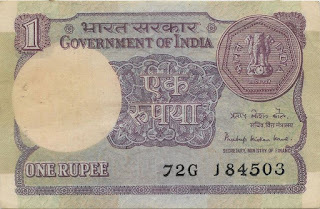 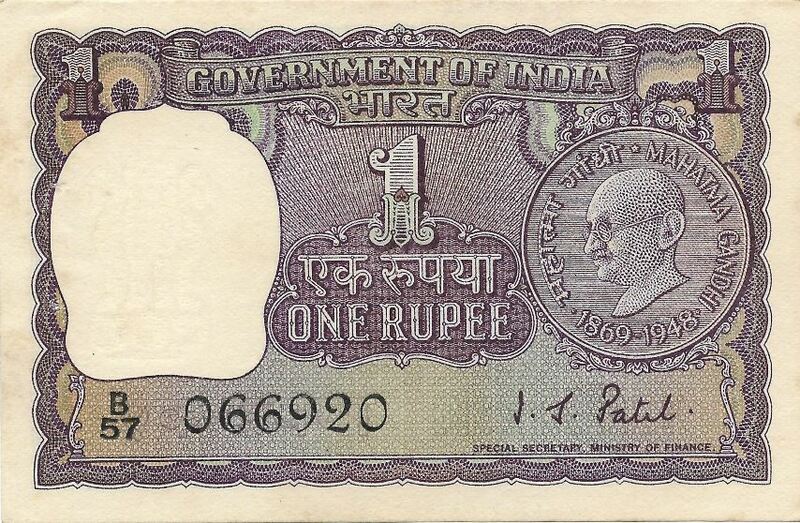 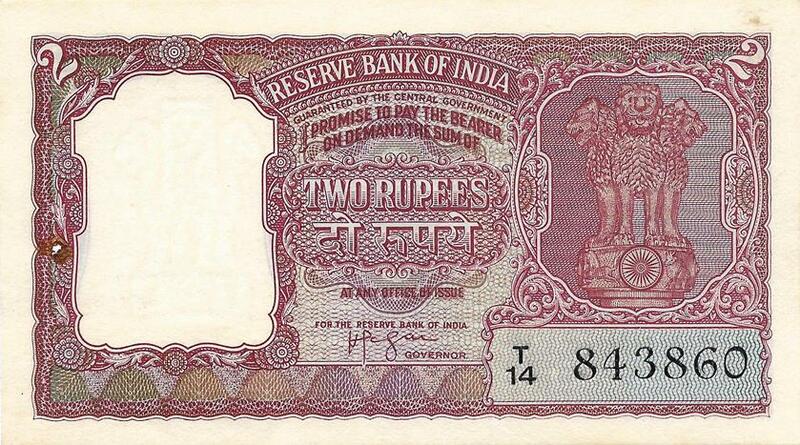 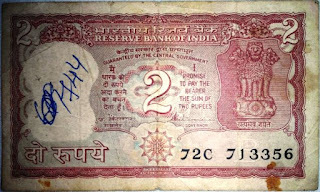 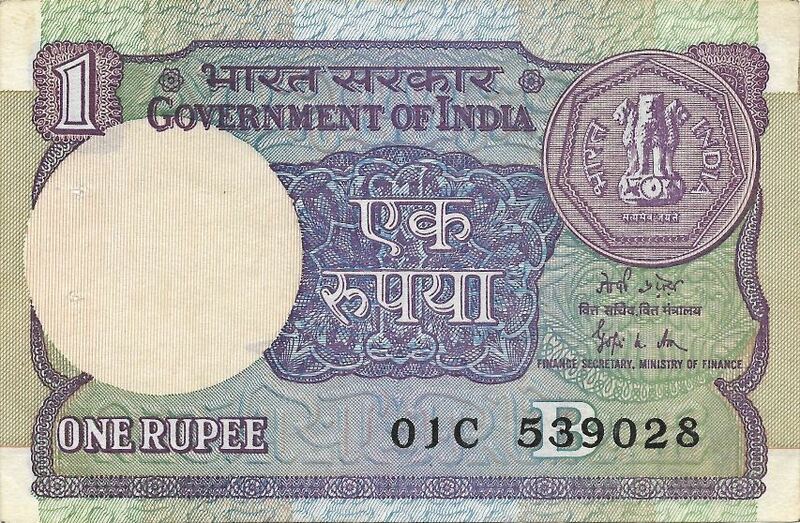 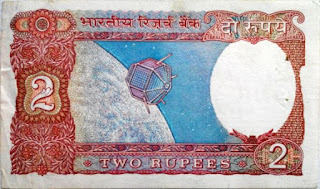 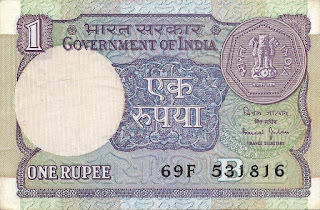 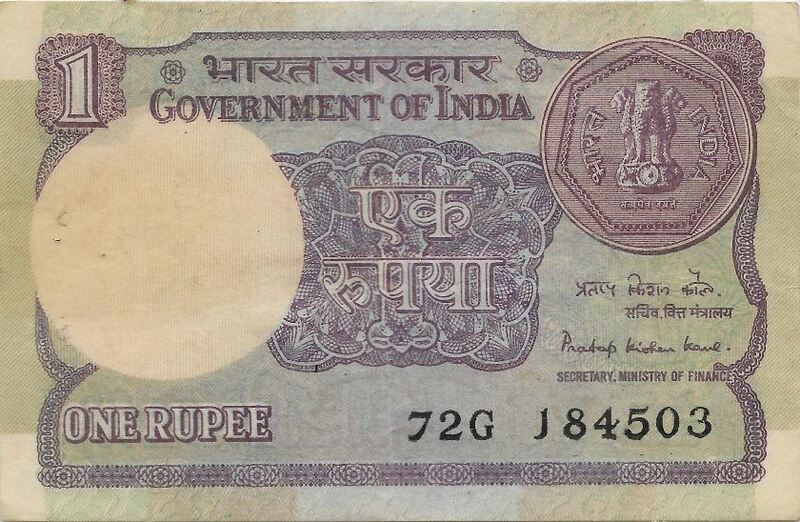 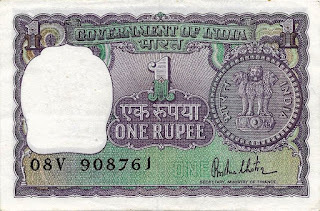 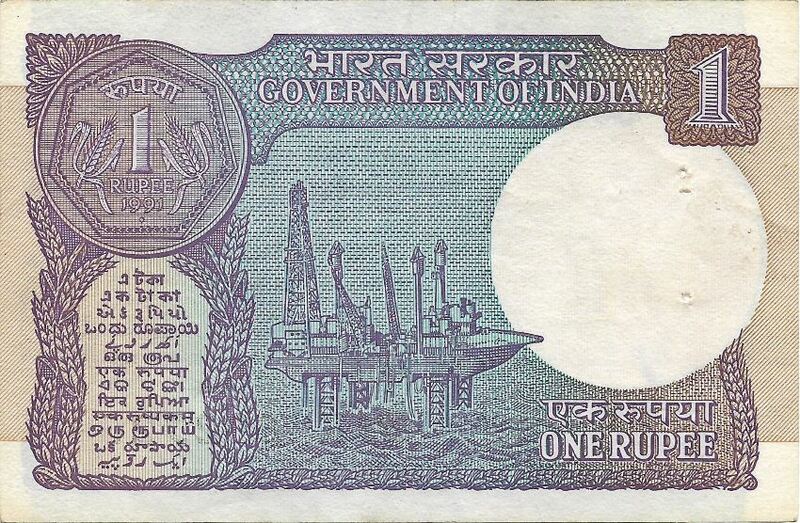 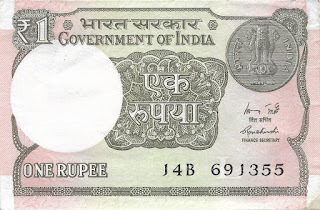 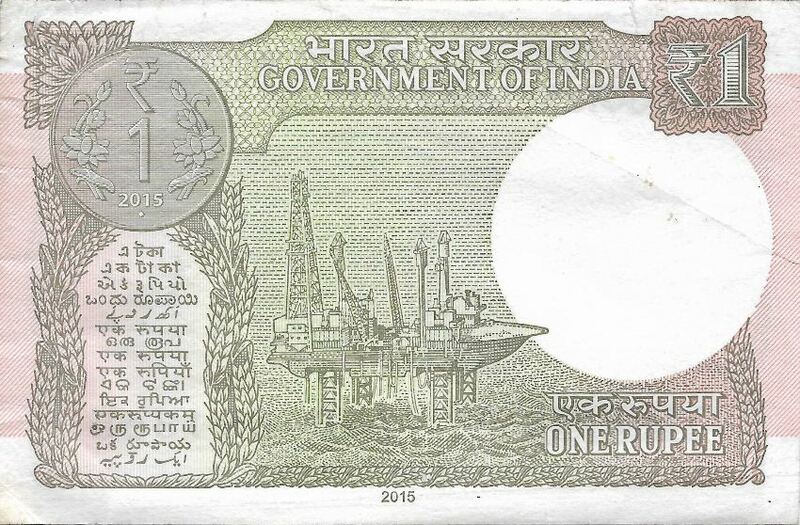 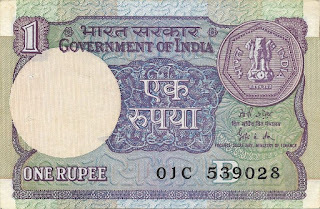 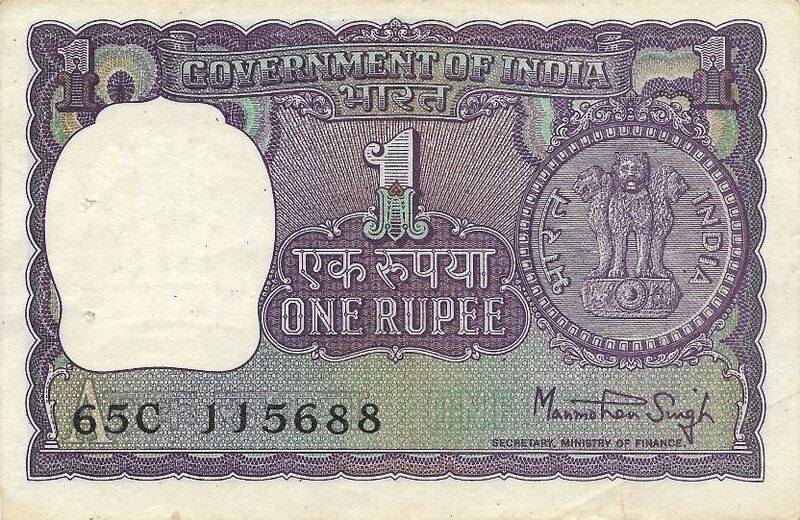 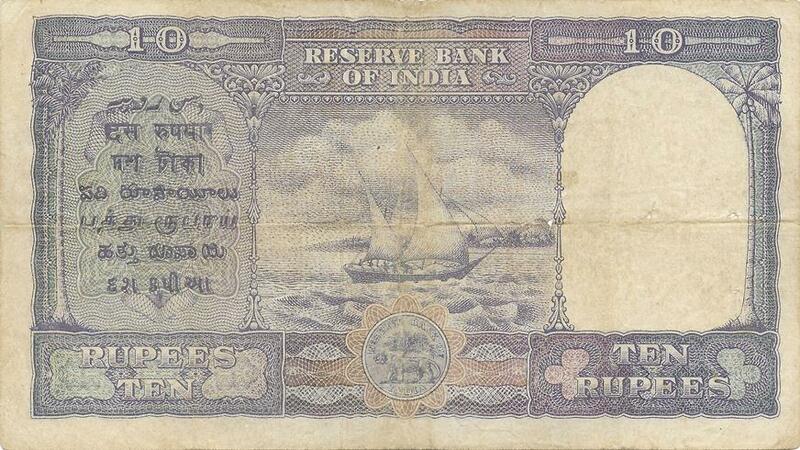 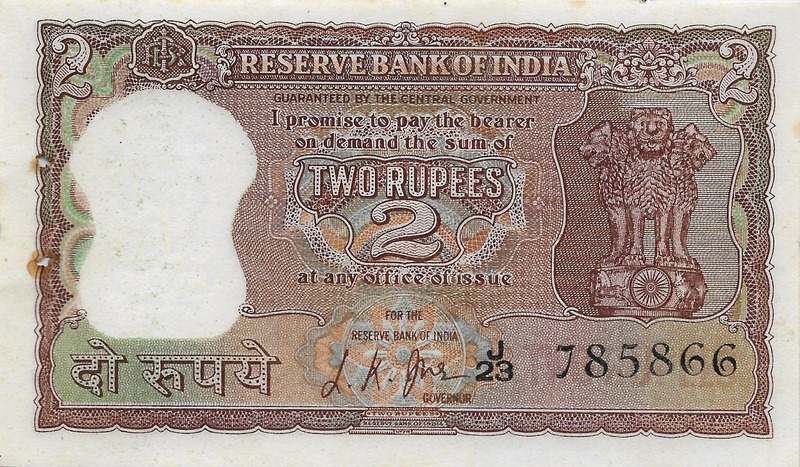 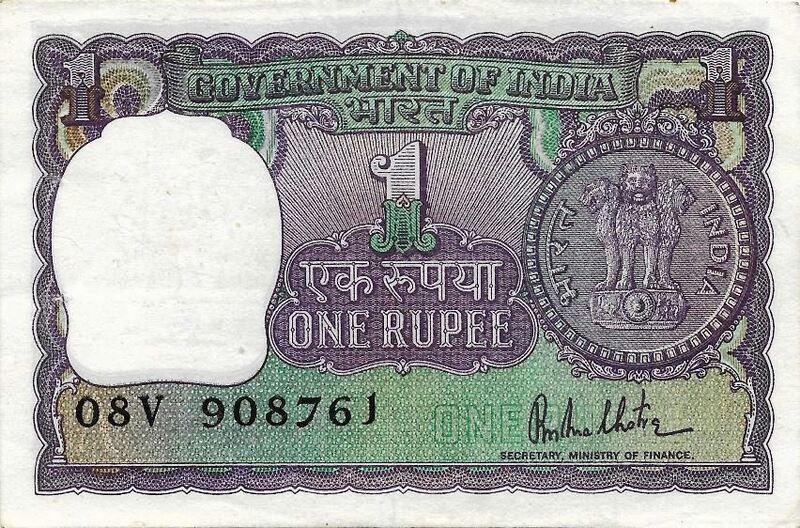 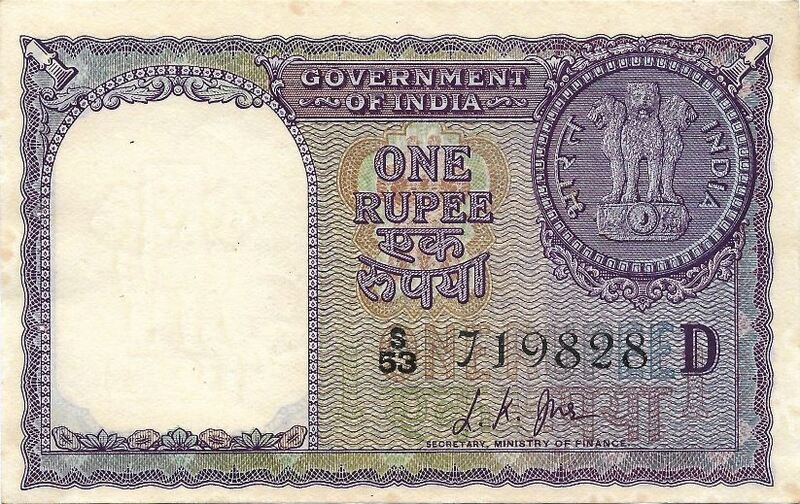 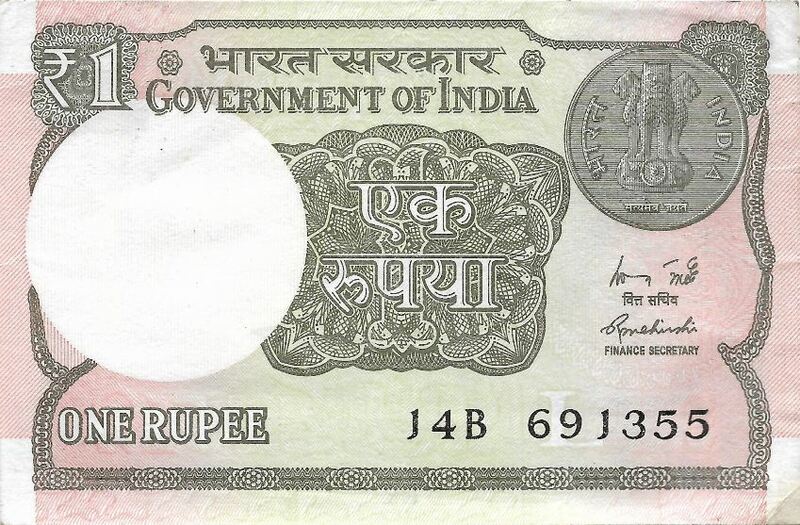 Remarks: Production of 2 Rupee banknote denomination was discontinued in February 1995. 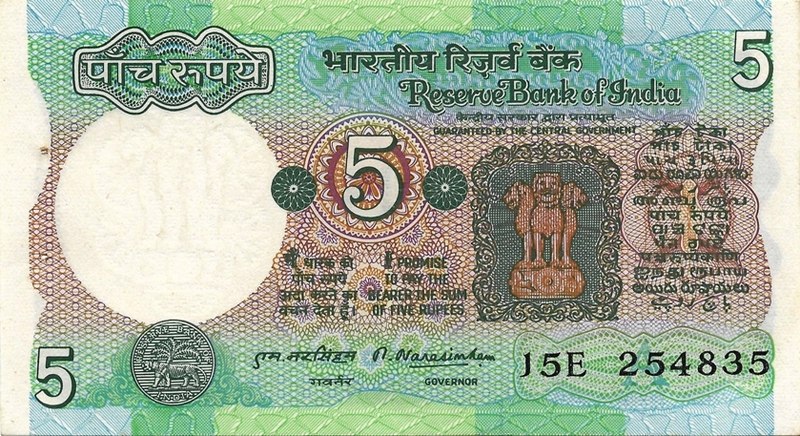 Numeral "5" at center; Lion Capital of Ashoka on the right side. New Tractor Design Introduced for the first time. Agriculture of India: Farmer tilling a field with a tractor. 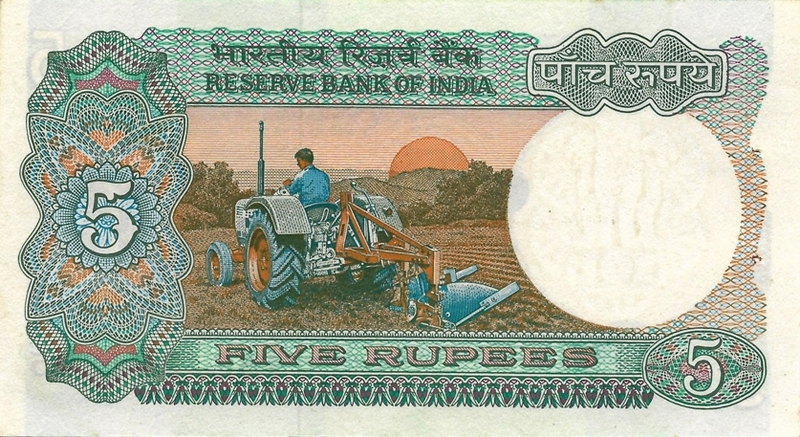 Sun setting. National Emblem of India; Mohandas Karamchand Gandhi (2 October 1869 – 30 January 1948); Seal of the Reserve Bank of India. Portrait of King George VI; Lake, mountain and banana plant. 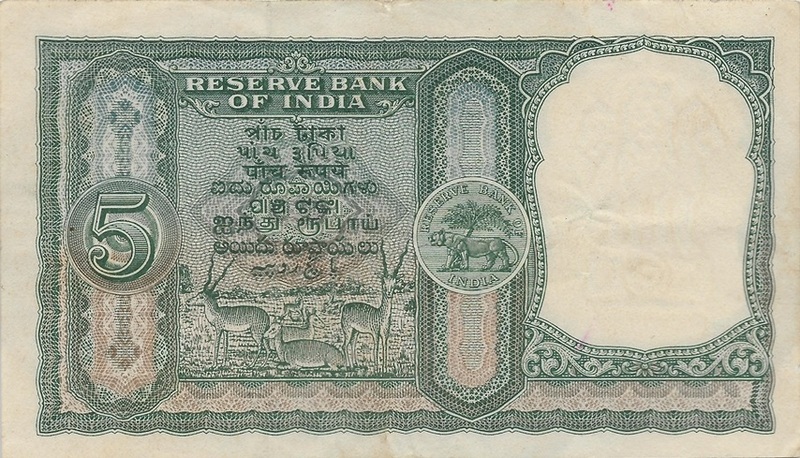 Seal of The Reserve Bank of India; 2 decorated white (royal) elephants with mahouts. Facing portrait of King George VI wearing the Imperial Crown. 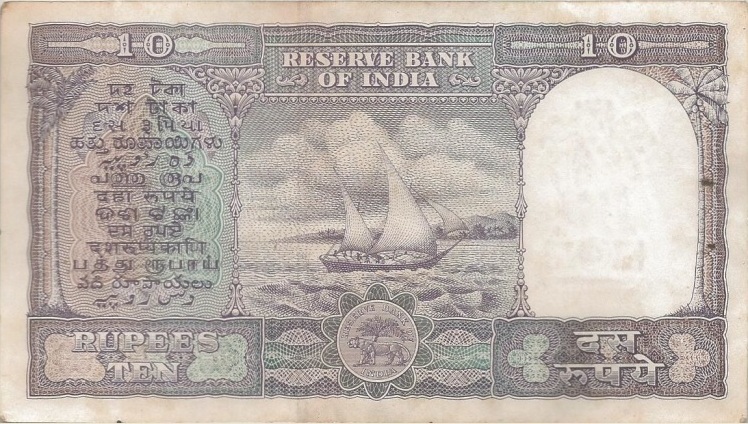 On the left side are denominations in seven Indian languages, in words; Sail boat or dhow in central panel. RBI logo in lower center. 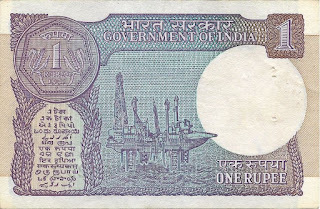 On the right and left sides are palm trees. Facing portrait of King George VI. 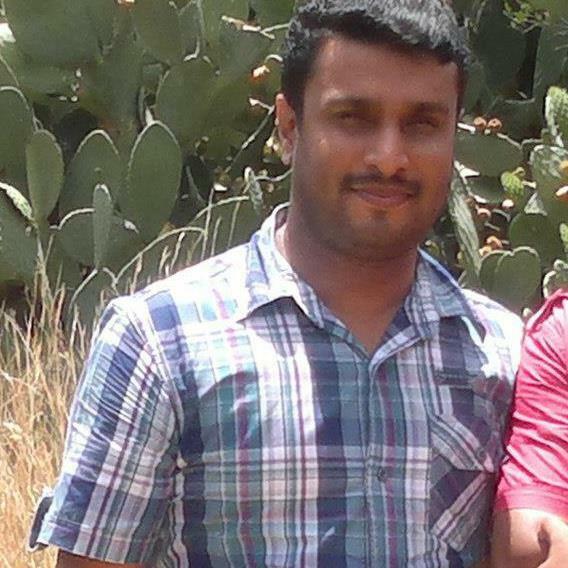 Sailing Dhow; 13 languages in language panel. 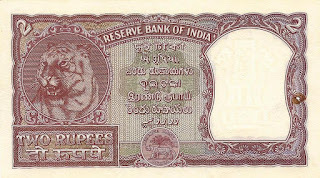 Shield shaped window for Ashoka Emblem as watermark on the left side. 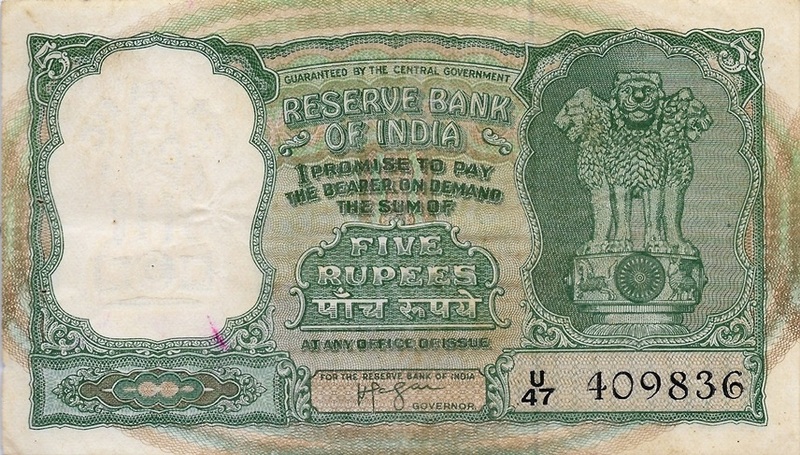 The emblem in ink on the right side. 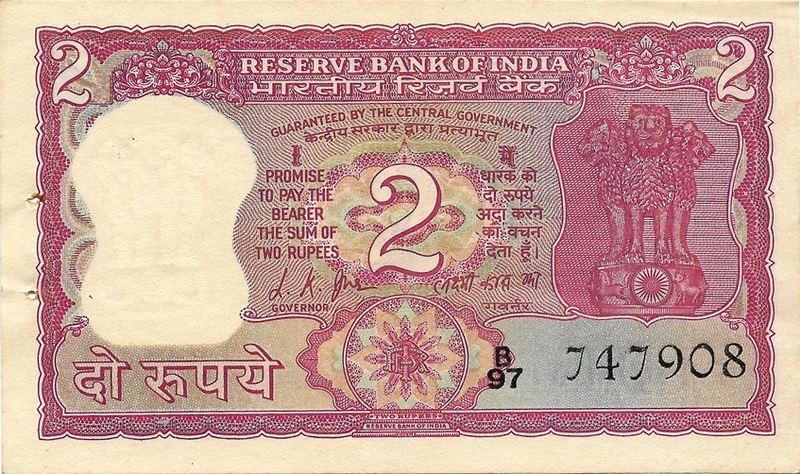 The value 20 written in center with the governor’s signature below. 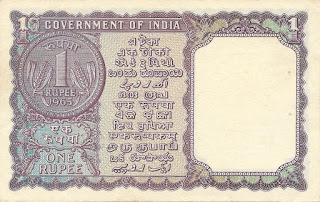 Parliament House; 13 languages in language panel. 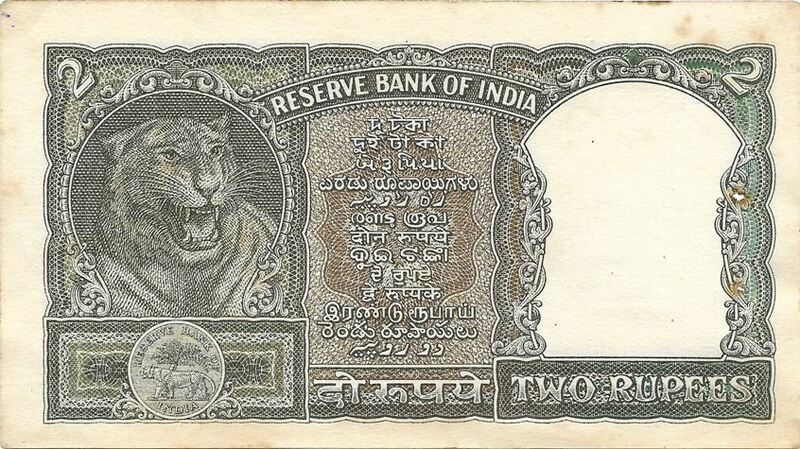 Lion Capital of Ashoka on the right side. 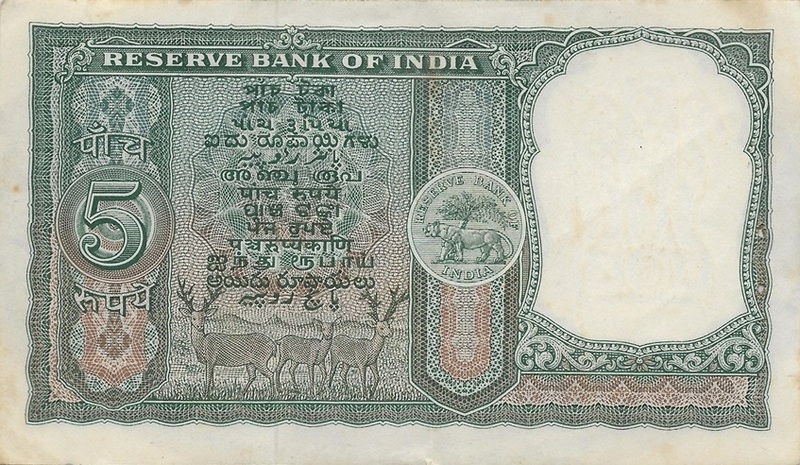 The language panel next to watermark with value in 13 languages. 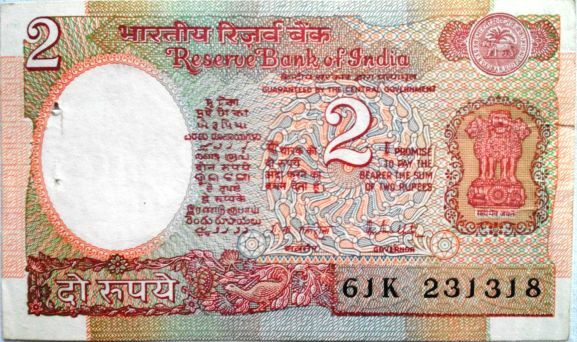 The value 20 in the center. 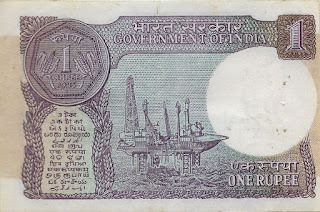 "Wheel" as in the Konark Sun Temple in Odisha. The temple in the background. 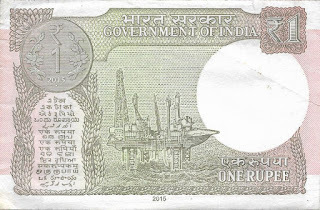 A view of the North Bay islands, which is a part of the Andaman and Nicobar Islands. 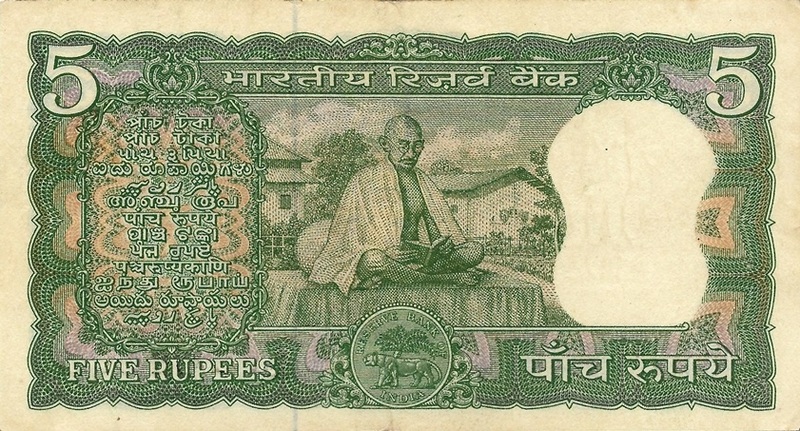 National Emblem of India; Mohandas Karamchand Gandhi (2 October 1869 – 30 January 1948). National Emblem of India; Mohendas Karamchand Gandhi (2 October 1869 – 30 January 1948); Seal of the Reserve Bank of India. 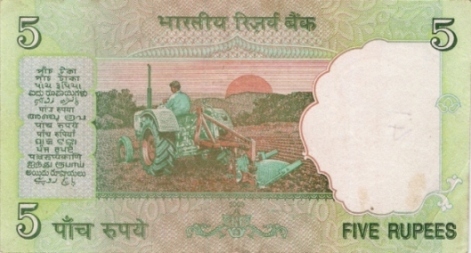 Economy of India: Grain harvesting combine; Oil rig; Space satellite dish; Metallurgy; Girl working on a computer.